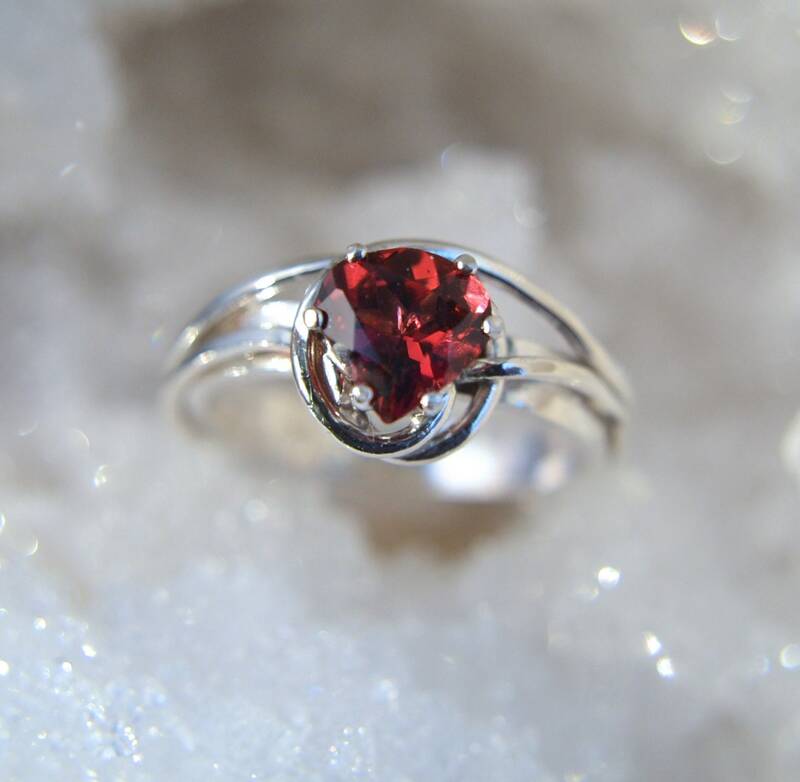 This ring features a beautiful raspberry red Rhodolite Garnet. Somehow, some people seem to believe that Garnets are a muddy red gemstone but this couldn't be farther from the truth with this gem. This baby is a clear sparkling red with a hint of pink when it catches the light. My gem dealer calls this shape a "heart" but I think of it more of a fat pear cut as it lacks the little indention that would be at the top of a heart. Either way, it is a good sized vibrant red Garnet. It is 6.5mm and 1.28 carats. The sterling silver band was handmade by me, one little piece at a time. I started with a 3mm strip of thick silver and built the design up from there. Two silver wires twist and turn as they tie themselves in a knot around the Garnet. This ring is a size 5.5. My rings come in a lovely ring box tied with a ribbon. It will be beautifully packaged and will arrive by insured mail within the US. For my international customers, I use First class mail with a custom's tracking number. Some countries charge tax or duty which will be the responsibility of the buyer. Absolutely gorgeous!!!! Stunning and great communication with the seller. This is a stunning ring! It arrived quickly. Caron is so talented with her jewlery. Her rings are unique & one of a kind. I asked if the ring could be resized & she did it within an incredibly short time. The ring is beautiful. Diaspore is a unique gem that has the ability to turn a beautiful green to a champagne colour. The greens are pretty but I haven't been able to see the champagne colours in the gem in the incadencent lighting or by candlelight. Thank you Caron for the beautiful ring. I accept Paypal or credit cards though Etsy. I will take a money order if you message me with your intentions. All payments are due within three days. Please choose carefully. If you are unhappy with your purchase, I will gladly take it back. I do ask that we do this within five days of you receiving your package. I will need the ring and ring box to be returned in the same condition that you received them. Please send me a message about your intentions. All of my jewelry is beautifully packaged and will arrive by first class insured mail within the US. I try to ship the same day or the next day after I receive your payment. You should have your package, (in the US) in three to five days. If you are in a hurry and want priority mail, just message me before you purchase. I'm nearly always here and would love to speak with you anytime. Feel free to ask questions. You never know what gemstones I might have on hand that are just waiting for you! Also, I'm good at keeping secrets and will work with you if you're trying to purchase a present. And guys, I'll even gift wrap it for you!